En este ejercicio de listening en inglés, voy a hablar sobre mi viaje por Mexico en 1993. Si tienes alguna pregunta, por favor dejala abajo, como un comentario. Hi, my name’s Tom the Traveller. In this audio blog I’m going to talk to you about my trip to Mexico 17 years ago. It was the Summer of 1993, and I was a university student studying Anthropology at Goldsmiths college in London. A group of college friends & I decided that we would spend the Summer holidays backpacking around Mexico, Guatemala and Belize. We were all about 20-21 years old, and none of us were experienced travelers, so we left London with a mixture of excitement and worry (preocupación). What would happen to us in Mexico? Would we survive (sobrevivir)? We flew from London into Mexico City airport, and my first memory was looking out the window of the aeroplane and thinking “How big is this city? !” It just seemed to go on and on (continuar) forever. We finally landed (aterrizar) and to save money (because we were poor backpackers (viajeros con mochilas), instead of taking a taxi, we got on the underground train (metro) to our hotel. I remember feeling rather paranoid during that trip as we had heard a few stories about the underground in Mexico City being dangerous for travelers. We made it in one piece (llegar sin problemas) though. After a few days in Mexico City, our first destination was Acapulco. We’d obviously heard about the famous Acapulco before, and anticipated drinking cocktails on the beach and enjoying some time relaxing by the sea. Unfortunately, a couple of days before our arrival a hurricane (huracán) had hit Acapulco, and there’d been a lot of damage. All I remember were that the streets were full of mud (lodo), and the skies were grey! We quickly moved on down the coast to Puerto Escondido, in search of (en busca de) the sun, and some waves (olas) to surf. On our first night in Puerto Escondido, we went out to a local restaurant, and my friend Josh ate fish. I don’t eat sea creatures, so opted for (elegir) a pizza. We got an early night and went to bed in our beach huts under mosquito nets (mosquiteros). In the middle of the night, I woke to the dreadful (terrible) sounds of Josh being terribly sick (vomitar) and at the same time as suffering from explosive diarrhea. Poor Josh. His fish had poisoned (intoxicar) him! I think he finally got to sleep around dawn (amanecer), and then when we both woke up again several hours later, we noticed that Josh was absolutely covered with Mosquito bites (picaduras), and there were about 10 mosquitoes, fat with his blood, on the inside of the mosquito net. Although we had both been under the same net, sharing a bed, for some reason they’d only bitten Josh. It must have been his particular odor (olor). We counted the bites, Josh had 49, and I had zero. Poor Josh! He didn’t have a great start to his dream trip to Mexico. But things got better! True or false: Tom was a student at London University when he went to Mexico. True or false: Tom had a mixture of emotions when he left England for Mexico. Why did Tom and his friends take an underground train and not a taxi in Mexico City? True or false: There was a hurricane whilst Tom was in Acapulco. Why did Tom and his friends leave Acapulco and go to Puerto Escondido? Why didn’t Tom eat fish on his first night in Puerto Escondido? What reason does Tom suggest for the mosquitoes biting Josh and not him? Did Tom and his friends have a lot of energy in Oaxaca? Why? If you know Mexico, where do you think the “Magical beach destination” is that they went to next? 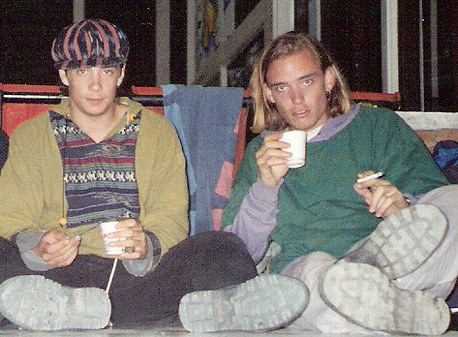 Do you think Tom was a hippie at this point in his life? True. Goldsmiths College is part of London University. Because they were poor – they didn’t have much money. False. There was a hurricane a couple of days before. To find the sun and go surfing. Because he doesn’t eat sea creatures – animals from the sea. No. They took it easy. It was hot! Put your answers below! He will tell you in part 2. He thinks he was too :-). Zapp! Inglés Listening Audio 2.5 - ¡Peligro! traveler ó traveller significan lo mismo, segun mi diccionario ambos tiene el mismo significado, pk uno se escribe con una l y el otro con doble ll.